Electric vehicle maker Tesla Motors has mastered the sporty two-seater and the elegant sedan. Now, it wants to conquer the family hauler. "All these things together make the car amazing,'' he said. The Model X is the third vehicle from 12-year-old Tesla, after the Roadster - which was discontinued in 2012 - and the Model S sedan. It should attract new customers - particularly women - to the brand, and it goes on sale as the market for luxury SUVs is booming. U.S. luxury SUV sales were up 17 percent through August, five times better than the industry as a whole. "If Tesla's going to be a more significant player, they need more products, and SUVs are what the market is demanding,'' said Michelle Krebs, a senior analyst with the car buying site AutoTrader.com. Musk said Tesla expects about half of its sales to be SUVs. But there are drawbacks. Only a fraction of the sippy-cup set will be able to afford the Model X, even with a $7,500 federal tax credit. A fully loaded performance model is $142,000; exact pricing of the base model hasn't been released, but Musk said the Model X will cost $5,000 more than an equivalent Model S, or around $93,000. Musk said the company will eventually offer a less expensive variant with a smaller battery. 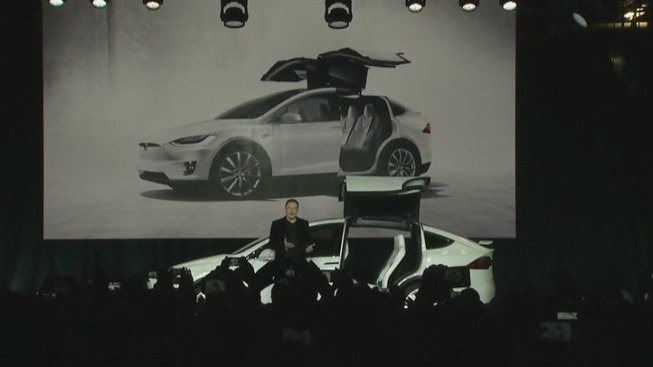 The Model X shares a platform and motor with the Model S, which is made at the same factory. But unlike the S, which has several battery options, the X only has a 90 kilowatt-hour battery and only comes with all-wheel drive. The 90D version will go 257 miles on a full charge, while the P90D performance version will go 250 miles. Tesla's high-speed ``ludicrous mode'' is offered on the P90D; it goes from 0 to 60 mph in 3.2 seconds. Musk says the company ``got a little carried away'' and might have designed the Model X differently if it had known the final engineering costs and manufacturing complexity.